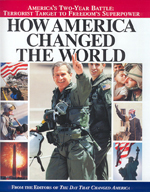 Memories in Print Favorite World Trade Center and Patriotic Books! and our knowledge of alternative choices. What is your purpose in buying a WTC book? To know: – about the building/architecture – about the day – about the terroists and their ideas? A detailed book on one of the above with opinions? A coffe table hardback of images to remember and pass on to generations? A simple book to show the significance? Many pages or just a few? others why we entered the War Against Terrorism, this is it. The magazine text and images track terrorism over the last 20 years and then proceeds through the War on Afghanistan and War on Iraq. It also includes a list of “Fallen Heros” as of June 2003. We found this stored in a Fire Fighter section – far away from the stack of World Trade Center books. was it seemed to have everything in it yet only has 48 pages. By “EVERYTHING” we mean a photos that tell a historical story. If you wanted one simple small book to store for yourself or a child to remind them of the significance of September 11th. This would be it. As the title suggests, this book has a collection of newspapers (dated Sep. 12th) not from just the USA but throughout the world. we found this book hit home bringing memories of how the news throughout the worls was non-stop hour after hour. This book will send a clear message to future generations showing how everything else ceased during that first week and all eyes were turned on New York. location, structure and ideas for why the towers stood so long and why they finally fell. Ground Zero (extremely helpful in providing an understanding/map of the area). area to go to the top and close up views of the outside architecture. Great book to answer: Exactly where was it and what was it like. artchitect, Minoru Yamasaki shown with a scale model for his buildings. arial views helping understand lower manhattan layout and the outside structural arches. This book has factual historical text added as opposed to Sometime Lofy Towers’ dedication to photos alone (above).